This is not your typical Parmesan chicken that you are used to ordering in a Italian restaurant but I’m telling you this is good! Not only is this good but it’s only FOUR ingredients and crazy simple to make. This recipe was a staple weekday dish that we would have with my family when I was growing up and I have always loved it. Lucas and I make it regularly and even he is a pro at making it. If he can do it, you can! Pre-heat oven to 400 degrees. 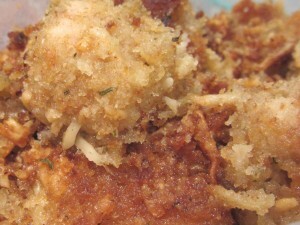 Mix Parmesan cheese and bread crumbs in a small mixing bowl. 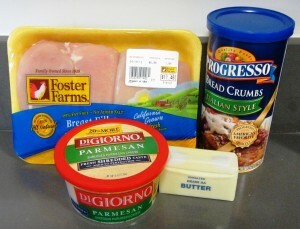 Dip chicken pieces in melted butter and immediately transfer pieces into Parmesan cheese/bread crumb mix. Once pieces are completely covered with mix place in a ceramic baking dish. Repeat steps until all pieces of chicken have been dipped in the butter and covered with the Parmesan cheese/bread crumb mix. Make sure that the chicken pieces are all one level in the baking dish so that everything cooks evenly and gets crispy! Bake in oven for 15 minutes. Hands down, one of our favorite meals! your second half. There are several vendors who choose having the reports from distinct labs.